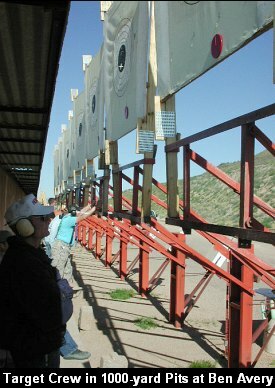 The Ben Avery Shooting Facility hosts the Arizona Long-Range Championship this weekend, February 7-8, 2009. This event will draw many of the top 1000-yard shooters from the Western states. Prior to the Long-Range Championships, a individual Palma match will be held today, Feb. 6th. The Palma match will have 15 shots for record at EACH of three distances: 800, 900, and 1000 yards. Photos courtesy AZ Desert Sharpshooters. On Saturday the 7th there will be two (2) Any-rifle, Any-sight 1000-yard matches (20 record rounds per match), followed by a 4-man team match with two shooters per realy. On Sunday the 8th, there will be two more Any-rifle, Any-sight 1000-yard matches (20 record rounds per match). The Championship will be determined based on combined Saturday and Sunday Aggregates. CLICK HERE for Match Program and Schedule. Member of the U.S. F-Class Open Team have been “working out” this week at Ben Avery, tuning their 6.5-284 rifles and working on team strategies. 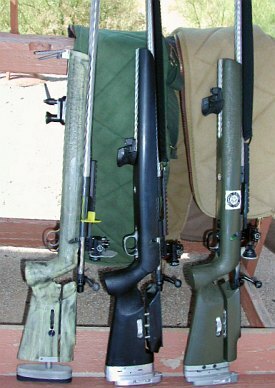 Many members of the Team will participate in the AZ Long-Range Championship this weekend. If you are in the Phoenix area, this is your chance to come out and meet team members and see some of America’s top long-range shooters in action. 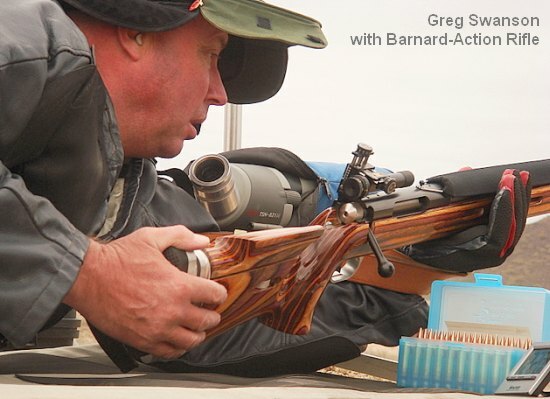 Share the post "AZ Long-Range Championships This Weekend at Ben Avery"
It you want to burn some time on a cold winter evening (or in the daytime–just don’t tell the boss), have fun with this online flash shooting game from Birchwood Casey. It’s easy — just aim the crosshairs at the ten-ring when each bull pops up. Warning: This game is loud, so you may want to turn down your sound levels before starting. Click the link below to go to the game page. The game has multiple levels. After you get through level one, you’ll be prompted to play again. Share the post "Test Your Skills with Bullseye Shooting Challenge"
For someone looking for a lightweight, compact, under-$400 spotting scope, we’ve been impressed by the Bushnell Elite 15-45x60mm. This straight-view spotter employs a roof-prism design to achieve high magnification with a short footprint. It is rubber-armored for durability. The Elite® 15-45x60mm is just 12.2 inches long and weighs a mere 26.5 ounces. Fogproof, waterproof, and shockproof, the Elite series of spotting scopes (there is also a 20-60x70mm version), also feature Bushnell’s patented Rainguard® lens coating. Field tests have shown that the hydrophobic Rainguard coating really works — condensation from rain, fog or snow forms in much smaller droplets than with standard coatings. 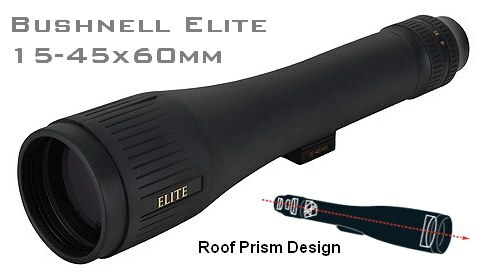 The U.S. military apparently agrees that the 15-35x60mm Elite is a lot of scope for the money. Bushnell Outdoor Products was recently awarded a contract for a special military version of the Elite® 15-45x60mm spotting scopes. The spotting scopes will be used by multi-national forces around the world. Bushnell started shipping the units in late 2008. Government buyers were impressed by the performance of the Elite 15-45 in a small, affordable package. The Elite 15-45x60mm is a compact unit that is easy to carry and quickly set up. 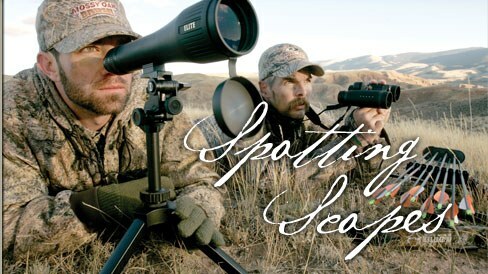 Bushnell will make some modifications to the spotting scopes to meet military specifications. For more info, visit www.bushnell.com or call 800-423-3537 for consumer inquiries. We recently field-tested two premium spotting scopes (Pentax 100mm and Swarovski 80mm), to determine if they could resolve 6mm bullet holes at 600 yards. They both did. In good viewing conditions, a premium spotter can resolve 6mm holes at very long ranges, but you’ll want at least 55x power (and more is better — 80x is not too much in ideal viewing conditions). Our test scopes had 100mm and 80mm objectives. Don’t expect this compact Bushnell 15-45x60mm to perform on a par with a $2000.00 spotting scope with more magnification and bigger lenses. Share the post "Bushnell Wins Military Contract for Compact Elite Spotting Scope"